Learn how to manage your social media efficiently & within your team. Improve your Zoho Social skills. Learn how to manage your social media with ease. + Downloads with lots of social media management advice. + Post training support via email or short online sessions. Designed for marketing execs, teams and agencies this one day Zoho Social training course will give you the confidence to manage your clients social media with ease. 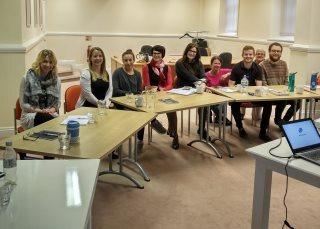 The main focus of the training is to help you put a social media strategy in place, learn advanced posting, listening & monitoring techniques and report success using the metrics that are important to you. On top of the training you also get a plenty of downloads, post training email support and short online sessions if needed. The session lasts between four and five hours and can be delivered one-to-one or to groups anywhere in the UK. Learn how to set up brand accounts and add social media networks. An in depth look at organising your brands/clients and networks. Learn how to collaborate within your team. We’ll take a look at the discussion system and how it can help your team. Discover how to add new users and create roles so you can manage your team effectively. We’ll also take a look at how to monitor activity using the audit log. An in depth look at the dashboard and interface of Zoho Social. Learn where the functionality is and what information is instantly at hand. Learn how to view and manage your social connections. Learn how to add leads to Zoho CRM and add extra information like phone numbers and notes. We’ll also look at how to quickly start a discussion on a connection. A long look at how to create posts using Zoho Social. We’ll take an in depth look at the composer plus show you how to quickly create posts directly from web pages. Learn what to schedule and how to schedule it. We’ll take an in depth look at the scheduling functions of Zoho Social including the interactive calendar, bulk scheduler and repeated posts function. Discover the power of SmartQ which lets you post when your audience is active. We’ll also learn how to create a custom publishing queue for your brand. What to monitor and how to monitor it. Listen to all your social media feeds in one place. Learn how to reply from the dashboard at create quick discussions with your team. Learn how to set up searches, use Twitter lists and quickly turn posts into monitoring streams. Discover how to manage your Facebook private messages and Twitter direct messages all in one place. Learn how to create reports that show off the metrics that are important to you. We’ll look at scheduled and custom reports.